On Thursday, I am very excited to be attending the Boston Symphony Orchestra's Project Beethoven event. A contest where music & fashion meet, 10 fashion students from local colleges designed evening wear inspired by the music of Ludwig von Beethoven. The event kicks off with a viewing of the dresses on models, then continues with an 8 pm concert of Beethoven’s Piano Concerto No. 3. Following the concert, the winner will be announced at a reception. The winning prize includes a spread in Boston Magazine- how lucky! 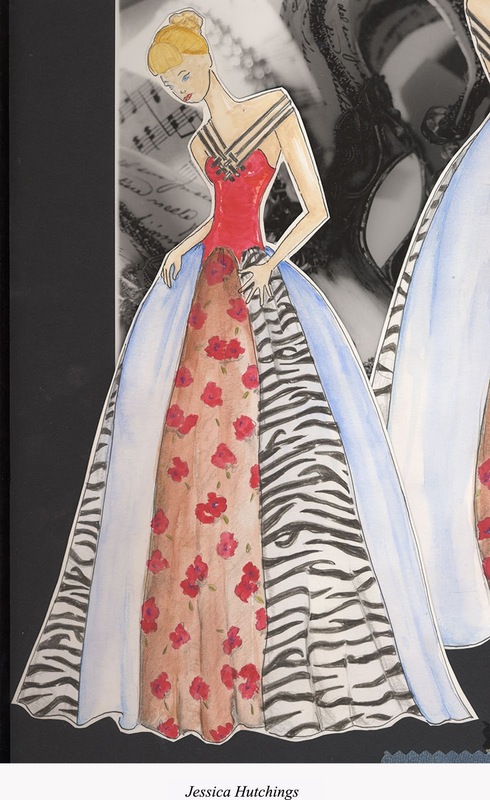 I was given the opportunity to interview the designer of this amazing dress- that I cannot wait to see in person! 1. When did you start designing? The first time I can remember designing was in 6th grade. Although I didn’t know very much about fashion or drawing figures for that matter, I would always be doodling dresses on dress forms. I found designing was the best creative outlet for me since I could make a dress my own and someday someone maybe wearing my name. 2. Who or what influences your designs? I take a lot of inspiration from what I see around me. The smallest things such as architecture or nature will influence my garments. I like to explore my creative boundaries, and come up with something different and new. My favorite thing to do is experiment with interweaving straps and creating a design within a design. 3. Tell us a little more about your experience with Project Beethoven and the process. 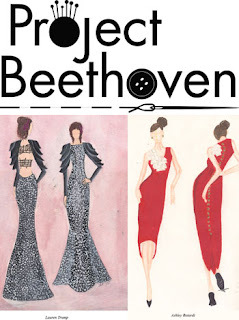 I really enjoyed this chance to be a finalist for Project Beethoven. I’ve had to think about every part of a design, the fabrics, the construction and the presentation. The hardest part I think is the presentation because it’s not something you’re taught in school, it’s just something that needs to come naturally. I needed to find a hairstyle that would highlight my dress and jewelry that would complete it. If one thing is wrong, it could completely throw off my look. The experience was also similar to the show Project Runway; I have felt the same stress and excitement of designing a garment and watching it come to life. Now I just can’t wait to see it go down the runway! 4. Who are your favorite everyday and high fashion designers? Vera Wang, Betsey Johnson and Jessica McClintock hands down. Not only do I love Vera Wang’s beautiful wedding dresses but her story inspires me as well. She originally didn’t plan for fashion to be part of her future, instead she was going to the Olympics for figure skating, but when that didn’t happen she entered the fashion industry. This helps remind me that even if my plan changes it may be for the better. Betsey Johnson’s creative style is always fun and flirty, but I especially love her accessories. Finally, Jessica McClintock was part of the reason I chose to pursue a fashion career. One of my first home coming dresses was a McClintock and most of the dresses after. They always seemed to fit like a glove and it originally had me thinking I would design clothing for people with body types that didn’t fit the “norm”. 5. 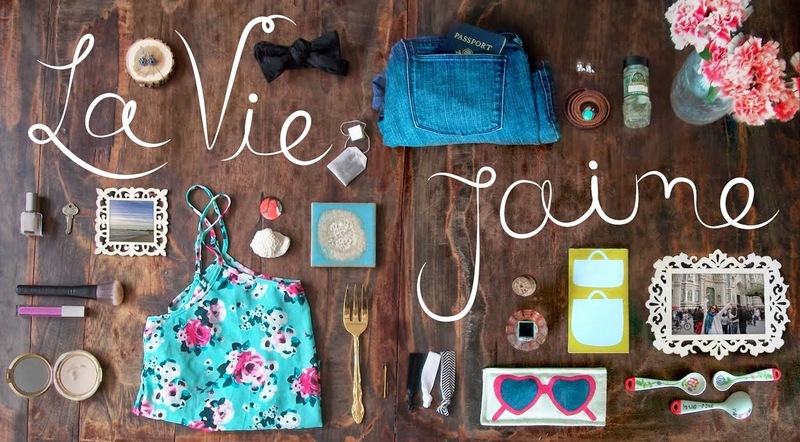 If you could take only 3 pieces of clothing or accessories to an island, what would you bring? Although I am a Fashion Design student ironically I don’t find clothes very important. I believe fashion is a way to express yourself and impress those around you; it has lost that once important use of practicality. If I only could bring three pieces of clothing, I would bring my favorite London sweater from Express, my favorite stretch jeans, and a change of clean underwear. If going to an island there would be no need to impress anyone, but to simply be as comfortable as you can be, and in these clothes I feel comfortable and clean underwear of course is a must! 6. What’s the most important lesson you’ve learned either in school, personal life, or during Project Beethoven? The most important lesson to me is one I am still learning: Be Yourself. Some find themselves right away and have their group of friends picked for life. I have always had friends but bonds weren’t permanently formed until I came to college were I have found my niche in a group of friends who support me as me. There is always more to learn and I still have yet to find a comfortable place in the fashion industry but as long as I am doing what I love I will find my niche soon. 7. Anything else you’d like to share with us? I just want to tell people to pursue your dreams to the fullest and take as many chances as you can. My mom was the one who really pushed me to enter Project Beethoven and without thinking I may have a chance to win I entered anyway. Now I am a finalist and putting everything I have into this garment, because I see where I could be if I pursue my dreams. Thank you, Jessica, and best of luck! Thanks also to the BSO for the complimentary ticket! Read more and get tickets here. If you are under 40, which I believe most of you are, the ticket is just $20! Photos courtesy of the BSO. what a unique event! great to know more about these kind of stuff! Great interview! very cool, great interview! have fun at the event. she sounds so inspiring and i love her philosophy on fashion! looks like it's going to be a great event, i wish i could go! Love that dress, I can't wait to see the real deal either! Oooh! This contest sounds like so much fun! What a fabulous event that sounds like. I bet you'll have a blast! What an awesome concept. I love it! This is a great interview- What a clever concept for a show- I love that several of 'The Arts' are combined and outside of the box inspiration is cultivated. what a great event. u are so lucky to get to go. This sounds so cool! And it's awesome that you got to interview Jessica. I can't wait to see the final dress! The sounds awesome! We (the Chicago Fashion Foundation)does a similar annual event every March and our theme this year is music! I'm excited to see the designer's work. Have a blast, take lots of pictures to share!! P.S. Thanks for your kind words yesterday, feeling much better!